8.1 liter with an Allison Transmition. Leather interior, Bose sound, dual zone heat/AC, rear defroster, Spray in bed liner, newer tires,heated power towing mirrors, great for towing. Diesel power without all the maintenance . Loaded truck, but no sunroof. No plow or 5th wheel ever on vehicle. FOR SALE. 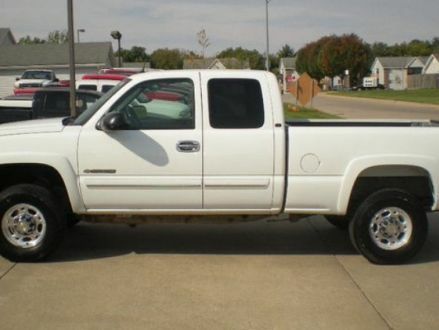 This is a White 2004 Chevrolet Silverado 2500 2500KHD with Gray interior, Automatic transmission, Four-Wheel Drive, and a 8-Cyl. engine. It's in Good condition, with 113,000 miles, and located in Elkhorn, WI.